In 1998's Kite, creator/director Yasuomi Umetsu explored the dark underworld of a teenage girl assassin. 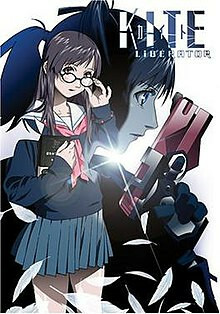 In Kite: Liberator, which is more of a spin-off than a direct sequel, ten years has now passed. A new teenage assassin is cleaning up the grimy streets of Tokyo. The police call her the Angel of Death, an unfeeling assassin who eliminates her targets with grace and precision, leaving only a flurry of feathers across the bloody crime scene as her calling card. What the public is unaware of is that this notorious hitman is actually a polite young lady named Monaka. Could the placid face of an innocent high school girl really disguise such a ruthless killer? Monaka seems to be just an average high school girl. But she has a dark and terrible secret linking her past to a murderous police detective and her future to a fatal duel with the one person she loves most in the world. Monaka seems to be just an average high school girl. But she has a dark and terrible secret.